•During use of RivEX you will typically create new outputs (datasets); examples are: nodes, sampling points, nearby networks and reaches. RivEX knows about these outputs as the information about these datasets are stored in the RivEX settings file. RivEX can re-establish links to these datasets after the build step. 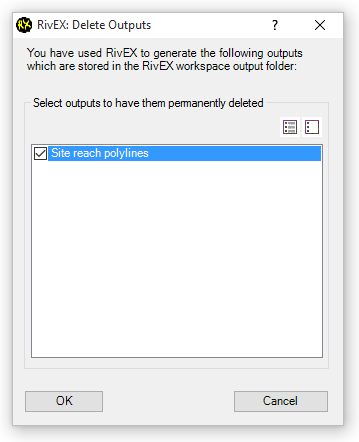 •This tool allows you to delete any outputs created by RivEX. Once deleted the Settings file is updated. •The difference between this tool and the Delete Workspace tool is that this tool will delete only the chosen outputs, all other information such as topology cache and error logs are left untouched. •Simply select the datasets you want to delete and press OK. In the image below a user has only ever created site reach polylines, if they had created other datasets with RivEX these would have been listed. •If you delete an output created by RivEX through another method (e.g. via ArcCatalog) then the Settings file will become out of sync with the dataset and you will get warning messages during the auto-load step.